Even though golf is a low-impact sport, common golf injuries include elbow tendonitis also known as golfers elbow, back strain, ankle or knee pain, rotator cuff tear or a wrist injury. Playing golf involves a lot of repetitive motion of swinging, bent back and posture, and tight grip for hours and often leads to overuse injuries or body strain. Wearing a brace while playing golf can help prevent injuries and provide additional support to help alleviate pain from nagging injury. 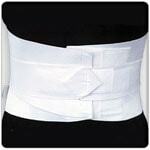 Buy Direct from US Manufacturer Outstanding Sacral support provided by ezywrap® vector straps. In conjunction with a sacral pad and our breathable, washable and durable single panel latex free elast Read more..
A novel approach to lumbosacral support. 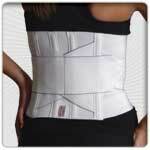 Superior support is provided by a resilient Thermal Form spinal insert (not included). This intermediate height support is made with our breathable, washable Read more..
Buy Direct from US Manufacturer Excellent compression and warmth for the tender elbow is provided by our 3 inch wide neoprene tennis elbow support. A sewn in felt pad adds the additional pressure ne Read more..
Buy Direct from US Manufacturer FirstIce Compression Ankle Wrap Reduces pain and swelling due to sprained ankles, inflamed tendons, surgery or trauma to the ankle. 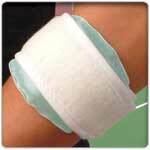 Our most popular and economical ankle support. 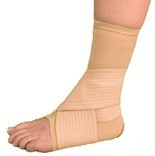 This breathable heavyweight elastic support creates the support needed in controlling the injured ankle. Open toe and heel pull up design assures comfor Read more..
Buy Direct from US Manufacturer The provides medial and lateral support and compression for relief from a wide range of patellofemoral disorders and knee instabilities. 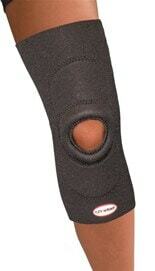 Buy Direct from US Manufacturer Get protection for your ankle now without the restriction found in other braces. Competitors’ braces are designed to keep your ankle from moving. This is not good bec Read more..
Buy Direct from US Manufacturer Provides Maximum Comfort and Scrotal Support. 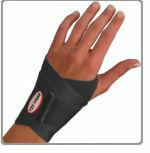 Buy Direct from US Manufacturer Offered in orthopedic Compression material or Neoprene , this wrist support is simple, yet effective. It is universal and unhindered by stays. Mild compression is ach Read more.. Thin enough to fit into a shoe yet rugged enough to provide superior non-slip support. 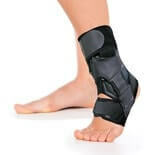 Velcro® compatible, latex free material wraps the foot in breathable compression and holds the foot in a neutral Read more..
Buy Direct from US Manufacturer Our Lycra covered, nylon lined neoprene provides constant compression and support in this adjustable donut open patella support. Optionally, available with popliteal Read more.. Durable, breathable elastic contours to support the ankle. 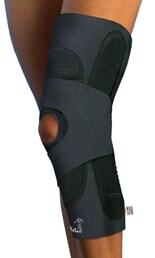 An integrated elastic strap with Velcro® closure provides optimal support to the injured ankle without adding bulk. Open toe and heel pull o Read more..
Buy Direct from US Manufacturer If neoprene is not for you, try our universal blue tennis elbow support. 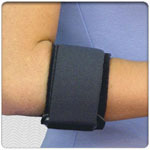 This 3 inch wide support is fabricated with our heavy-duty duck material and lined with cott Read more..
Buy Direct from US Manufacturer A unique system that features a three in one solution for elbow pain management. 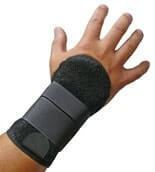 This popular model is Velcro® compatible and features a pocket which will hold either Read more..
Buy Direct from US Manufacturer The WSO™ (Wrist Stabilizing Orthosis) Wrist Guard was developed in cooperation with Athletic Trainers and Orthotists who were interested in minimizing unwanted wrist Read more.. 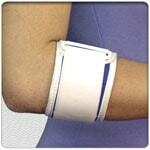 Prevent golf injuries with our golf braces and supports for the ankle, knee, back, elbow, shoulder, and more!